Context: There is an active selection on the canvas. (This structure can be atom, bond, group, etc.) 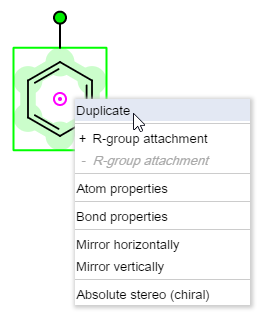 Right-clicking on the selected structure. Duplicate: Makes a duplicate from the selected structure. Atom properties: Opens the Atom properties dialog window, where the properties of all the selected atoms can be changed. Bond properties: Opens the Bond properties dialog window, where the properties of all the selected bonds can be changed. Mirror horizontally: Mirrors a selected molecule or fragment horizontally. Mirror vertically: Mirrors a selected molecule or fragment vertically.